My wife found a bottle of this about a year ago for $10 at our local Marshalls store, and she bought it for me just for the hell of it. When she pulled it out of the bag, I recognized the fragrance as something I'd read bad reviews about. Also, with the word "Light" in the name, I wasn't expecting to like it. I did, however, appreciate her thinking about me in buying it. I can't believe I'm writing this, but Kapsule Light is a great fragrance. It is true that there's nothing unique about it at all - it's yet another "woody, fresh, citrusy, spicy, etc." light fragrance, a style that has been trendy and has been boring me to tears since the 1990s. You've smelled hundreds of fragrances just like this, trust me. But like Bulgari Aqua Marine, it's a fragrance that is so well composed, I can't help but enjoy it. Kapsule Light handles citrus, wood and spicy notes like clove and anise in such a tasteful and light-handed way, so that everything balances out beautifully. The effect is one of great airiness and transparency, with all of its facets glimmering around you like tiny jewels. I'd go so far as to say that Kapsule Light is almost as good as the amazing Essenza di Zegna (Ermenigildo Zegna) and Comme Une Evidence Homme (Yves Rocher), which I consider to be hands down the two greatest modern woody spicy fragrances for men. Kapsule Light is one of a set of Kapsule fragrances that are meant to be purchased together, and then layered with one another. Lagerfeld probably thought this concept was really groundbreaking, but I think it's pretty stupid, especially considering each of these runs for about $60 as a suggested retail price. 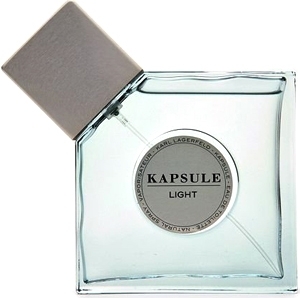 I haven't smelled the other Kapsule perfumes, but I can say that Kapsule Light is good and substantial enough to be worn as a self-standing fragrance on its own. Kapsule Light isn't even my style, and I don't wear it very often, but it doesn't diminish how good it is. I wouldn't recommend spending more than $25 US for this, simply because there are so many other fragrances just like it for the same price. However, it can be found online for decent prices, and is worth purchasing if you don't already own many woody citrus scents.